Martin Miller knew a thing or two about love. He should...........He married three times. "Love conquers all!" he'd tell you. But can love overcome obsession?........... Tame madness? Martin thought so. He'd been making his gin that way since 1999. Marrying his obsession with crafting the perfect English gin, to the inspired madness of blending it to strength using Icelandic spring water. 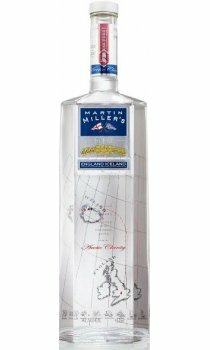 Martin Miller's Gin three times Gold Medal winner of the International Wines and Spirits Challenge. A cool, crisp, cucumber flavoured Gin. Rather dry but not especially junipery. Produces a G&T you can knock back with great happiness. My wife's favourite Gin - I like MM a lot (both regular and Westbourne strength, which I confess I don;t find particularly different) but I prefer a richer, more citrusey style. Nonetheless, delicious. If you want a really dry gin, this is the gin of gins. You can taste the cold crispness of the Icelandic waters used in making the gin. This is a worthy buy.